January 7, 2010 by Ken Ward Jr.
That quote above is the conclusion of a blockbuster study being published tomorrow by a group of the nation’s top scientists, detailing the incredibly damaging environmental impacts of mountaintop removal coal mining and the failed efforts at reclaiming mined land or mitigating the effects. .. Clearly, current attempts to regulate MTM/VF practices are inadequate … Regulators should no longer ignore rigorous science. In their paper, the authors outline severe environmental degradation taking place at mining sites and downstream. The practice destroys extensive tracts of deciduous forests and buries small streams that play essential roles in the overall health of entire watersheds. Waterborne contaminants enter streams that remain below valley fills and can be transported great distances into larger bodies of water. Despite much debate in the United States, surprisingly little attention has been given to the growing scientific evidence of the negative impacts of MTM/VF. Our analysis of current peer-reviewed studies and of new water-quality data from WV streams revealed serious environmental impacts that mitigation practices cannot successfully address. Published studies also show a high potential for human health impacts. The authors note that the Surface Mining Control and Reclamation Act imposes requirements to minimize impacts on the land and on natural channels, such as requiring that water discharged from mines will not degrade stream water quality below established federal standards. Yet mine-related contaminants persist in streams well below valley fills, forests are destroyed, headwater streams are lost, and biodiversity is reduced; all of these demonstrate that MTM/VF causes significant environmental damage despite regulatory requirements to minimize impacts. Current mitigation strategies are meant to compensate for lost stream habitat and functions but do not; water-quality degradation caused by mining activities is neither prevented nor corrected during reclamation or mitigation. 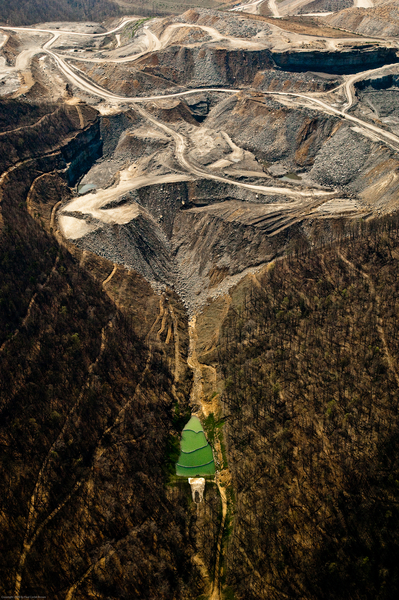 The scientific evidence of the severe environmental and human impacts from mountaintop removal is strong and irrefutable. Its impacts are pervasive and long lasting and there is no evidence that any mitigation practices successfully reverse the damage it causes. The chemicals released into streams from valley fills contain a variety of ions and trace metals which are toxic or debilitating for many organisms, which explains why biodiversity is reduced below valley fills. Palmer and Bernhardt and some of the other authors are familiar to some Coal Tattoo readers, and certainly to the coal industry. They’ve testified at Congress and in court cases about mountaintop removal’s impacts, sometimes serving as expert witnesses for citizen groups working to curb the practice. But, they told me today that this paper was not funded by any non-profit groups, and that it underwent the most rigorous peer review by Science that they had ever seen. Other authors included William H. Schlesinger, president of the Cary Institute of Ecosystem Studies, Keith Eshleman of the University of Maryland’s Appalachian Laboratory, Michael Hendryx of West Virginia University, and Orie Loucks of Miami University in Oxford, OH. Updated with this link to video of the press conference. — Downstream water quality impacts: Below valley fills in the Central Appalachians, streams are characterized by increases in pH, electrical conductivity, and total dissolved solids due to elevated concentrations of sulfate (SO4), calcium, magnesium, and bicarbonate ions … We found that significant linear increases in the concentrations of metals, as well as decreases in multiple measures of biological health, were associated with increases in stream water SO4 in streams below mined sites … Recovery of biodiversity in mining waste-impacted streams has not been documented, and SO4 pollution is known to persist long after mining ceases. — Potential for human health impacts: Even after mine site reclamation (attempts to return a site to premined conditions), groundwater samples from domestic supply wells have higher levels of mine-derived chemical constituents than well water from unmined areas … Adult hospitalizations for chronic pulmonary disorders and hypertension are elevated as a function of county-level coal production, as are rates of mortality, lung cancer, and chronic heart, lung, and kidney disease. — Mitigation effects: Many reclaimed areas show little or no growth of woody vegetation and minimal carbon storage even after 15 years … Mitigation plans generally propose creation of intermittently flowing streams off-site. Stream creation typically involves building channels with morphologies similar to unaffected streams; however, because they are on or near valley fills, the surrounding topography, vegetation, soils, hydrology, and water chemistry are fundamentally altered from the premining state … U.S. rules have considered stream creation a valid form of mitigation while acknowledging the lack of science documenting its efficacy. Over the last 30 years, there has been a global increase in surface mining, and it is now the dominant driver of land-use change in the central Appalachian region. We now know that surface mining has extraordinary consequences for both aquatic and terrestrial ecosystems. Notwithstanding recent attempts to improve reclamation, the immense scale of mountaintop mining makes it unrealistic to think that true restoration or mitigation is possible with current techniques. It is our hope that this will provide the science that the administration needs. My only point was that because a study in “peer reviewed” doesn’t make it gospel. If we had acted as quickly on the new ice age predictions as some would like us to act on global warming we would have been wrong. If the elimination of fossile fuels is what it takes it has to be done over a generation with new technology which should be in the developmental stages now. Wind/solar and other types of energy are great, but currently can’t keep us the strong nation we are now. I don’t buy that this battle is over MTR, it over coal mining and use in general. You’re right — just because a study is “peer reviewed” doesn’t make it gospel. And just because something is in one peer reviewed article certainly doesn’t make it correct. But in this instance, the authors cited the findings of many peer-reviewed articles from many fields — and their conclusions of what those studies add up to was peer-reviewed and published in what is almost certainly the most respected scientific journal in the world. The reactions I’ve seen so far from the coal industry and its supporters have been to criticize the authors, without offering any science of its own to show this paper is wrong. On the issue of climate change … to say that we as a planet or a nation are considering “acting quickly” is not accurate, I don’t believe. The first IPCC assessment was published in 1990. Follow-up assessments (based on the growing body of peer-reviewed literature) were published in 1992, 1995, 2001, and 2007. With each study, the weight of the evidence grew, and the inaction continues. Ken is right that the coal industry does not have studies to show that mining has no impacts on water, forest, mayflies, etc. Everything we humans do on earth has an impact. Every decision needs to be based on costs and benefits. I’m sure that there are considerable studies and data regarding the benefits of electricity and minerals in general. After all everything that we buy and consume is either mined or grown and that which is grown would be exceedingly difficult without mining. The easiest way to discourage mining is to quit demanding the products that use the minerals. Since most of the benefit side seems to be ignored or downplayed in this blog, many are left trying to argue points or studies regarding the cost side of the mining equation. Coal is definitely on the defensive since there’s so much well-funded offense. Regarding the Hendryx/Ahern study I believe that the study understated the benefits of coal since the benefits of electricity and steel were ignored, as were many taxes that are paid by the industry. Link to article and supporting material. I think that is an interesting point, it made me think a bit. Thanks for sparking my thinking cap.Bombshell study: MTR impacts ‘pervasive and irreversible’ Coal Tattoo was a wonderful read.